Willa Cather is born this day in 1873. Gregg LeFevre's playful, repetitive take on a famous passage in Willa Cather's O Pioneers! is immortalized on Library Way across from the New York Public Library. Written while Willa Cather was living in New York City in 1913, O Pioneers! is the first of her Great Plains Trilogy, followed by The Song of the Lark (1915) and My Ántonia (1918). The title comes from the poem by Walt Whitman, Pioneers! O Pioneers! Another connection that Willa Cather has to poetry is that her first published work in 1903 was not a novel but a collection of poetry entitled, April Twilights. Met with mixed reviews upon its publication she did find a fan in Mark Twain who praised her poem, The Palatine. But back to the plaque. 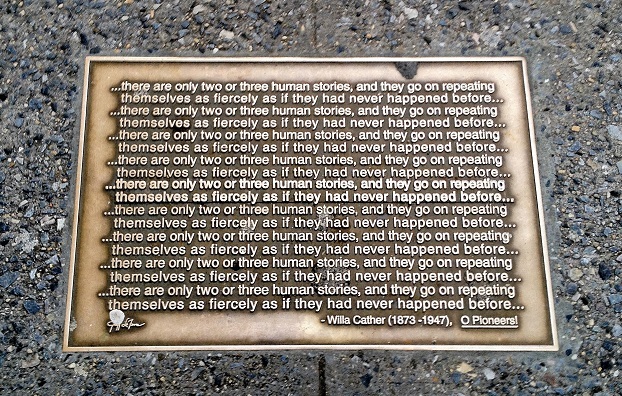 Do you agree with Cather's assertion that there are only two or three human stories? Whether it be a birthday, anniversary or publication date of a seminal work, the Bar None Group will revisit these 40+ quotations from time to time — quotations that inspire one to write, read, explore and embrace literature. We last visited Richard Eberhart.